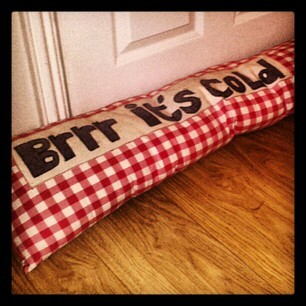 Draught excluders…not the sexiest topic, but might actually save some pennies on the heating bill this year. I made mine in less than an hour a long time ago, and it gets brought out every winter…which says something about the draughty houses I live in I guess. Measure out the fabric against the pillows and cut enough to make a skinny tube. Where as with most sewing you need to leave a seam allowance, with this you need to go at least half and inch smaller all the way around to ensure a tight fit. Sew up three of the sides to make a tube. If you wanted applique letters or a design added, make sure you do this first on one of the tube sides. Stuff tube with pillows. With the spare end, tie a big chunky knot. Chuck down by draught door and feel your bill-budget going a smidge further!